Behind every well-dressed man is a well-equipped wardrobe. 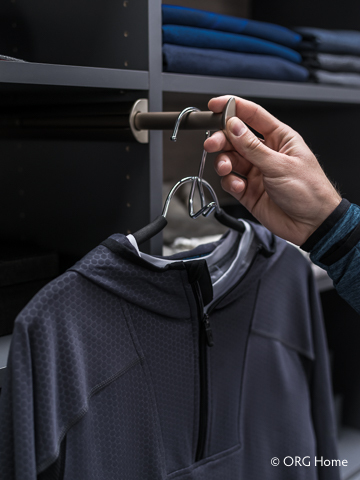 Whether you’re hitting the gym or the town, it’s easy to dress sharp for every occasion with the help of a custom closet solution. Here are four closet organization ideas to make it simple to find what you need, while maintaining a tidy, sophisticated storage space. No more hunting for your favorite shirt. 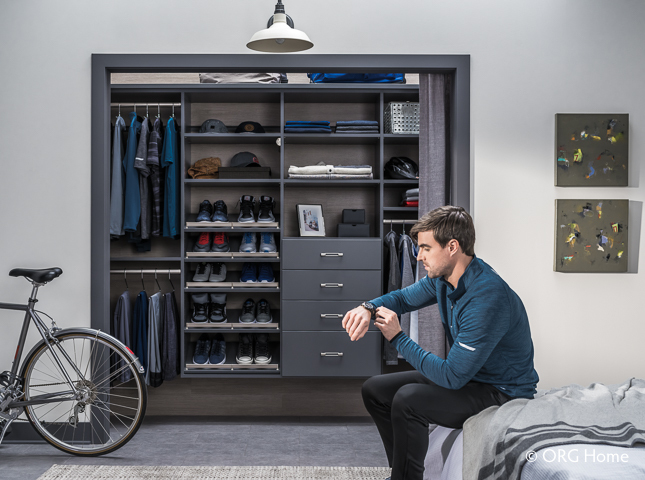 An open, reach-in closet displays all of your options at once, streamlining the process of choosing your clothes or putting them away for the day. Include adjustable-height shelves to make space for everything from bike helmets to sweaters, and separate hanging rods for shirts and pants to keep you well organized. Choose appealing colors and finishes such as the Blue Stone color and Matte Nickel hardware shown here, to create a timeless, masculine aesthetic that elevates the look of your room. 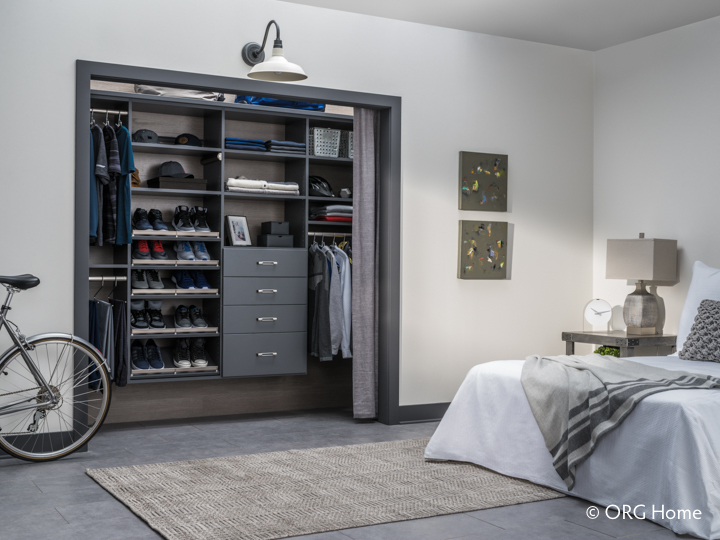 This upscale, industrial design creates showcase for your clothes and accessories so you’ll be proud to keep your closet on display. Make it simple to select your shoes for any outfit or occasion. A tower of slanted shoe shelves with grooved toe guards can be adjusted easily to make room for every pair, from sneakers to cowboy boots. 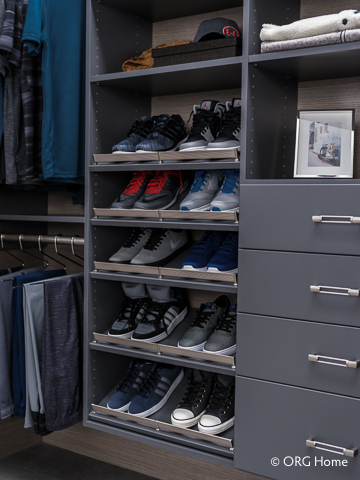 Add a tower of drawers for socks and underclothes, along with little helpers like pull-out valet rods, belt racks, and tie racks to keep your accessories tamed. Take advantage of open shelving to display photos, trophies, or other mementoes that uplift or inspire you. Or use the space as a convenient spot to drop your phone, watch, and wallet at the end of the day. Don’t let your style get squeezed out by inadequate storage space. Upgrade your closet, and elevate your style.